Dr. Jon Paul Trevisani discusses how a series of CoolSculpting® treatments can reduce the appearance of fatty tissue in bothersome areas without surgery, and he touches upon differences between this technique and liposuction. Orlando, FL — Dr. Jon Paul Trevisani is a plastic surgeon in Orlando who offers a wide range of surgical and non-surgical cosmetic treatments. A recent addition to his armamentarium, CoolSculpting® offers a noninvasive way for men and women to address fatty tissue that is resistant to diet and exercise. 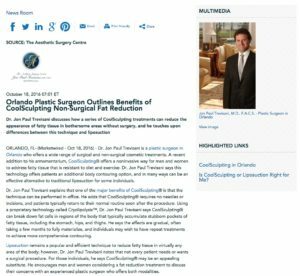 Dr. Jon Paul Trevisani says this technology offers patients an additional body contouring option, and in many ways can be an effective alternative to traditional liposuction for some individuals. Dr. Jon Paul Trevisani explains that one of the major benefits of CoolSculpting® is that the technique can be performed in-office. He adds that CoolSculpting® requires no needles or incisions, and patients typically return to their normal routine soon after the procedure. Using a proprietary technology called Cryolipolysis™, Dr. Jon Paul Trevisani says CoolSculpting® can break down fat cells in regions of the body that typically accumulate stubborn pockets of fatty tissue, including the stomach, hips, and thighs. He says the effects are gradual, often taking a few months to fully materialize, and individuals may wish to have repeat treatments to achieve more comprehensive contouring. Liposuction remains a popular and efficient technique to reduce fatty tissue in virtually any area of the body; however, Dr. Jon Paul Trevisani notes that not every patient needs or wants a surgical procedure. For those individuals, he says CoolSculpting® may be an appealing substitute. He encourages men and women considering a fat reduction treatment to discuss their concerns with an experienced plastic surgeon who offers both modalities. Founder and Medical Director of the Aesthetic Surgery Centre, Dr. Jon Paul Trevisani is a board certified plastic surgeon and Fellow of the American College of Surgeons. He earned his medical degree from the University of Nebraska Medical School, followed by additional medical training at the University of Kansas Medical Center. Dr. Jon Paul Trevisani is an active member of several esteemed medical organizations, including the American Society of Plastic Surgeons and the American Society for Aesthetic Plastic Surgery. Furthermore, he has been named as one of America’s Top Plastic Surgeons by the Consumers’ Research Council. Dr. Jon Paul Trevisani is available for interview upon request.